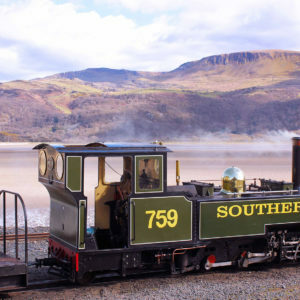 Experience the beauty of the Mawddach Estuary on this miniature, half-sized coastal railway. Connecting the village of Fairbourne with the sea at Barmouth Ferry. 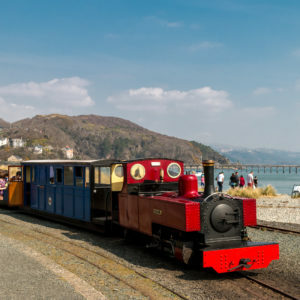 The Fairbourne Railway has been running from Fairbourne village to the mouth of the Mawddach Estuary, connecting with the ferry across the harbour to Barmouth, for over 100 years. In the 1890s, the village of Fairbourne was being built with holidaymakers in mind. A tramway was used to move materials and this was soon carrying passengers. As the line changed over the years, it was upgraded for steam trains. It started as a two-foot gauge horse-drawn tramway in 1896, which was then converted to a 15-inch gauge railway in 1916. The line was completely re built in 1986 to a 12.25-inch gauge. 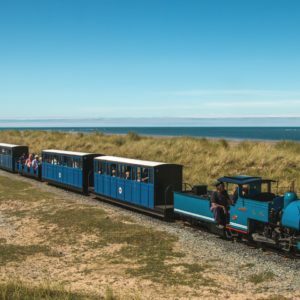 Enjoy a 2-mile journey from the village of Fairbourne, along the beach and out to the end of the peninsular and back. 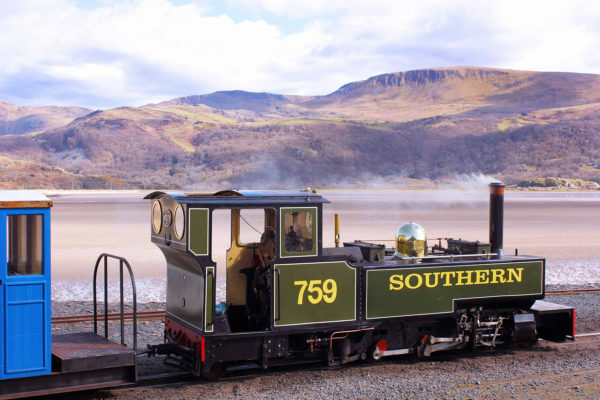 Four steam locomotives, which are half sized replicas of narrow-gauge engines, take you on your trip: Yeo, Sherpa, Beddgelert and Russell. Or journey on the 12.25-inch gauge diesel engine ‘Tony’, named after the late Prof. Tony Atkinson who was instrumental in preserving the line. The railway is home to a museum and an indoor model railway with a large G-Scale layout. There are two cafés located at either end of the railway. The Station Café is situated on the Fairbourne platform; enjoy a choice of paninis, sandwiches, cakes, speciality coffees, teas and soft drinks. This is the place to get your train tickets and souvenirs. The Harbour View Café is situated at the terminus of the railway at Barmouth Ferry Station. 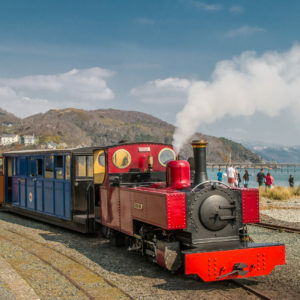 Enjoy a tasty snack and the fabulous view of Barmouth Harbour and the Mawddach estuary, watching the trains come and go. 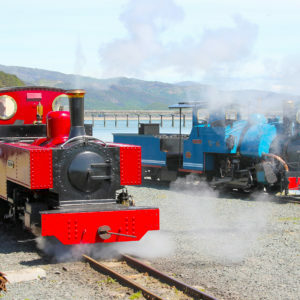 Fairbourne is served by the Cambrian Coast railway, operated by Transport for Wales. From Barmouth quayside you can catch the pedestrian Ferry and connect with the train at Barmouth Ferry Station. Fairbourne is served by Traws Cymru T2 buses to Dolgellau. Then to Fairbourne with Arriva No 62 or No 43 and Lloyd's Coaches No X28 bus service. 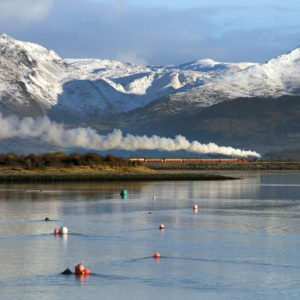 The railway is situated on the Mid-Wales coast on the South side of the Mawddach Estuary. 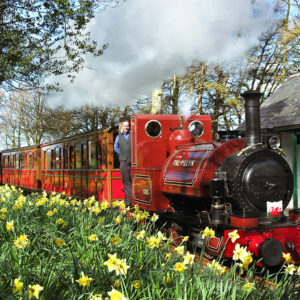 Fairbourne village is located halfway between Tywyn and Dolgellau, just off the A493. Over the road from the Fairbourne main terminus there is a small Network Rail Car Park at Fairbourne Station.